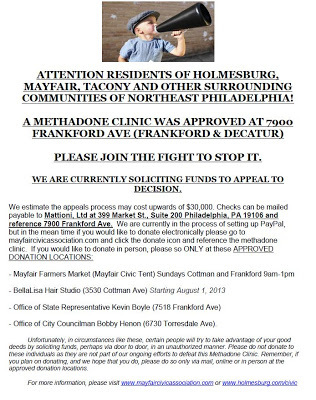 ATTENTION RESIDENTS OF HOLMESBURG, MAYFAIR, TACONY AND OTHER SURROUNDING COMMUNITIES OF NORTHEAST PHILADELPHIA! PLEASE JOIN THE FIGHT TO STOP IT. WE ARE CURRENTLY SOLICITING FUNDS TO APPEAL TO DECISION. – Office of City Councilman Bobby Henon (6730 Torresdale Ave). Unfortunately, in circumstances like these, certain people will try to take advantage of your good deeds by soliciting funds, perhaps via door to door, in an unauthorized manner. 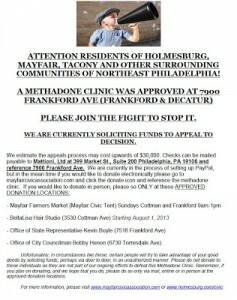 Please do not donate to these individuals as they are not part of our ongoing efforts to defeat this Methadone Clinic. Remember, if you plan on donating, and we hope that you do, please do so only via mail, online or in person at the approved donation locations.